The private Dream Chaser space plane took to the skies Tuesday (May 29), kicking off a flight-test program that will vet the vehicle's ability to carry astronauts to and from low-Earth orbit. 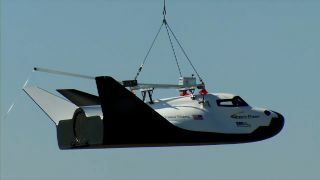 The Dream Chaser, which is built by aerospace firm Sierra Nevada Corp. (SNC), did not fly under its own power during the test. Instead it was held aloft the entire time by an Erickson Air-Crane heavy-lift helicopter, which hauled the space plane through the skies near Denver to verify its aerodynamic flight performance. Still, the so-called captive-carry test marks an important step forward in the Dream Chaser's progress, company officials said. Sierra Nevada is one of four spaceship-building companies to receive funding from NASA's Commercial Crew Development (CCDev) program, which is encouraging private American vehicles to fill the astronaut-carrying void left by the retirement of the space shuttle fleet last year. Sierra Nevada got more than $100 million in two rounds of CCDev funding over the past two years, which it's using to develop the Dream Chaser. Tuesday's captive-carry test allows the company to check off another milestone stipulated in the second round, known as CCDev-2. "This is a very positive success for the Dream Chaser team and their innovative approach," said Ed Mango, NASA's Commercial Crew Program manager. "I applaud and encourage the designers and engineers to continue their efforts in meeting the objectives of the rest of their CCDev-2 milestones." Data from the captive-carry test will be used to evaluate and prove hardware, facilities and ground operations in preparation for approach and landing tests, during which the Dream Chaser will be carried into the skies and then dropped. The first of those test flights is planned for later this year, officials said. The Dream Chaser team conducted several other tests before taking off on Tuesday. For example, engineers performed a ground-based landing gear test and a flight readiness review, and they also demonstrated the release mechanism between the space plane and the helicopter. The other three CCDev-funded companies are Blue Origin, Boeing and SpaceX, which on Thursday (May 31) wrapped up a historic demonstration flight of its Dragon capsule to the space station. During the test flight, the unmanned Dragon became the only private vehicle ever to dock with the orbiting lab. Dragon and its Falcon 9 rocket appear on course to begin a series of 12 contracted supply missions for NASA this coming September. SpaceX is upgrading Dragon to carry crew, and it hopes to win a NASA contract to transport astronauts to low-Earth orbit as well. SpaceX officials have estimated that Dragon should be ready to do so within the next three years. The Dream Chaser, which looks like a miniature space shuttle, is the only vehicle in the bunch that has wings and lands horizontally on a runway (though it launches vertically, atop an Atlas 5 rocket). The space plane is designed to carry up to seven astronauts, and company officials have said it should be operational by 2016. NASA has said it wants at least two private American vehicles to be up and running by 2017. The space agency currently depends on Russian Soyuz spacecraft to ferry its astronauts to and from the orbiting lab.